Most folks know that hops is used in beer but brewers aside, few people know what it really is or why. Hops is to beer what lemon is to lemon aid. It is a bittering ingredient without which, beer would be cloyingly sweet. These two bines* growing on our shop wall, provide more than enough hops for the100 or so gallons of beer we make each year. The bines produce clusters of flowers that are the actual source of the needed ingredient. They are harvested in Fall and can be used as is but are usually dryed for long term storage. It takes about an ounce of these dried flowers to bitter a ten gallon batch of beer but different styles of beer require different levels of bittering. 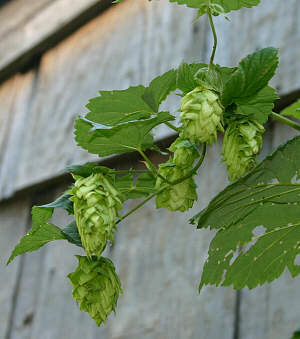 As a point of interest, mass produced American beers use very little hops because of the cost. They compensate by using raw sugar instead of barley malt which of couse is another cost savings. Raw sugar ferments out completely while malt leaves a lot of unfermented sugars and proteins behind. This of course, explains why American beers are so tasteless. At the base of each petal is a gland that produces tiny yellow globules called lupulins. 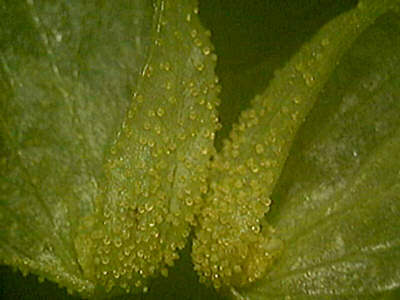 These are the bittering agent in hops. If one opens up a petal, there is a general yellow cast but they are so small that it is hard to distinguish individual lupulins. The aroma is very pleasant and spicy. After harvesting or otherwise handling hops, one's hands become yellow and sticky and strongly aromatic. 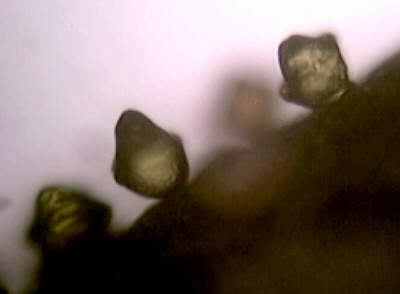 This microscopic view shows several individual lupulins. They are approximately 200 microns high and this photo was taken at 100X. * Bines is not a typo. 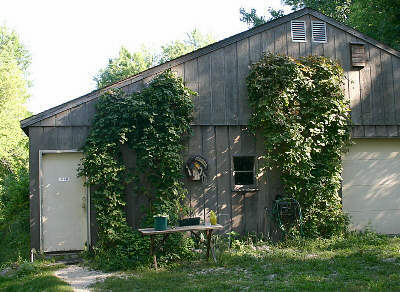 It is a technical term to differentiate from vines which have tendrils and suckers to attach to supports. Bines rely on stiff hairs to help in climbing. For more information on making beer, check out the Beer link below.